Phone Calls – The board members of our community associations are not charged for telephone calls. Our client board members and their manager or management company may telephone us at no charge for discussions up to fifteen minutes in length. This aspect has been tremendously helpful to boards and professional property managers in preventing legal problems before they occur. 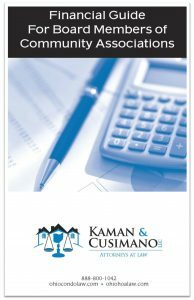 Operations Guide for Board Members of Community Associations – a 92 page booklet that provides in-depth but easy to follow guidance on topics such as board member liability, insurance, meeting requirements and minutes, rule adoption and enforcement, records retention, contracting recommendations, and board safety. 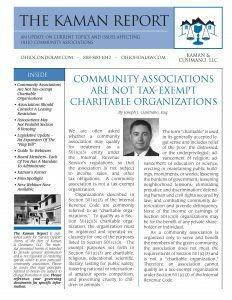 Financial Guide for Board Members of Community Associations – a 54 page booklet that provides detailed information on a number of topics, including financial safeguards for your association’s money, budget requirements, and reserve obligations. 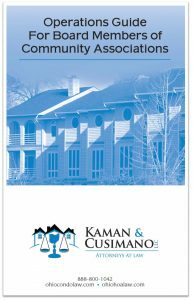 Kaman Reports – Our firm regularly writes newsletters, entitled The Kaman Report, for our clients that address important and timely issues facing Ohio’s condominium and homeowner associations. 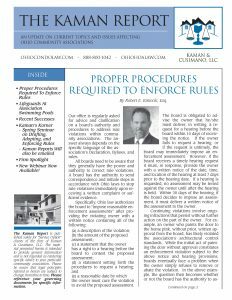 As most of our attorneys currently live or have lived in a condominium or homeowner association and have served on their board, we utilize first-hand experience to develop articles and helpful information for our clients. 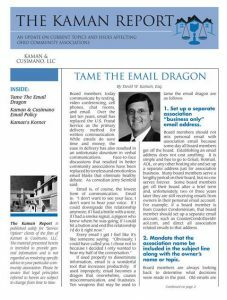 ATLAS – Kaman & Cusimano has developed an extensive online educational resource for Board members: the Association Total Legal Assistance System. In addition to providing up to the second case status information, this interactive website provides board members with an extensive archive or newsletters, articles, forms, handbooks, and educational opportunities. Further, ATLAS contains the popular “Success Basics for Board Members” webinar that provides all board members with the introductory basics necessary to help achieve success as a board member.